I’m all about creating new spaces. 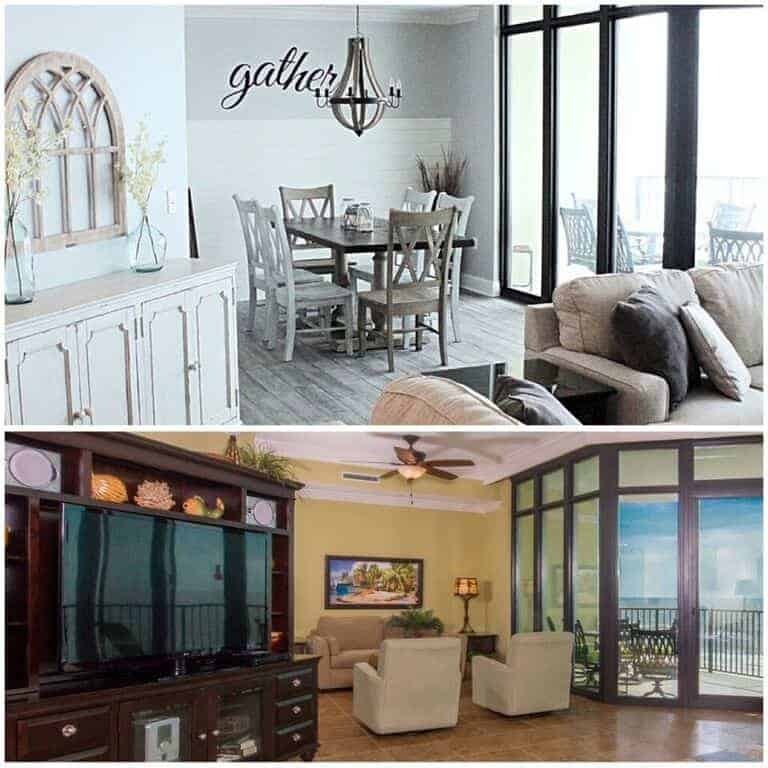 I’m more about creating new spaces that don’t take a lot of time or money! This project encompasses both of those. 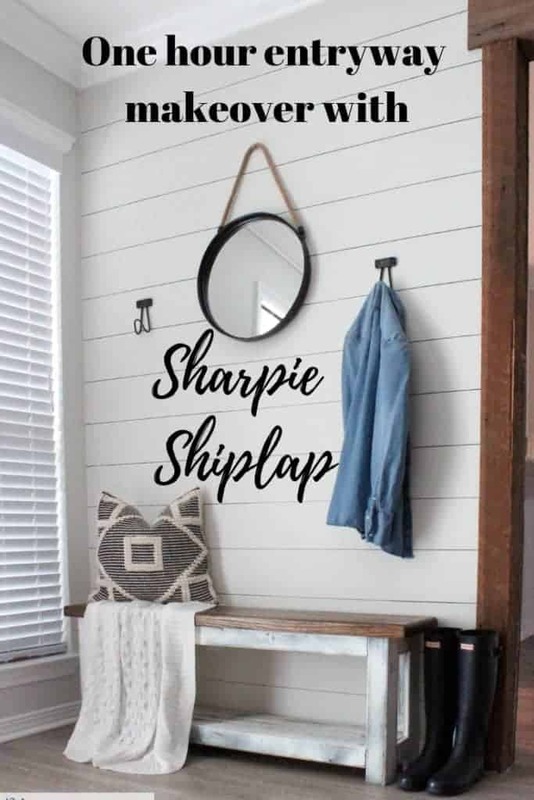 I still can’t believe how stinkin’ real the Sharpie shiplap looks! 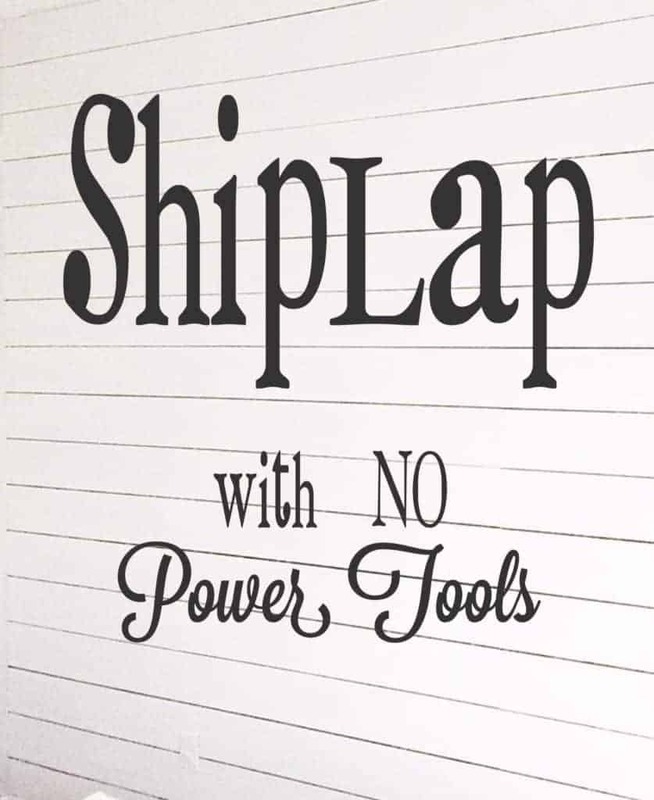 Speaking of Shiplap, I’m no stranger to creating my own DIY shiplap. 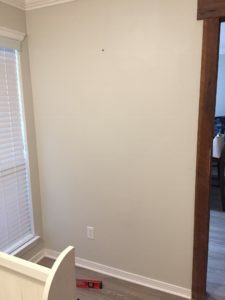 In our old house I made over a wall with Shiplap with NO power tools! 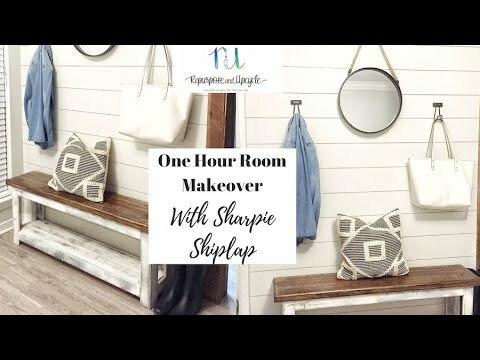 This time around, though, I made this DIY shiplap even easier! 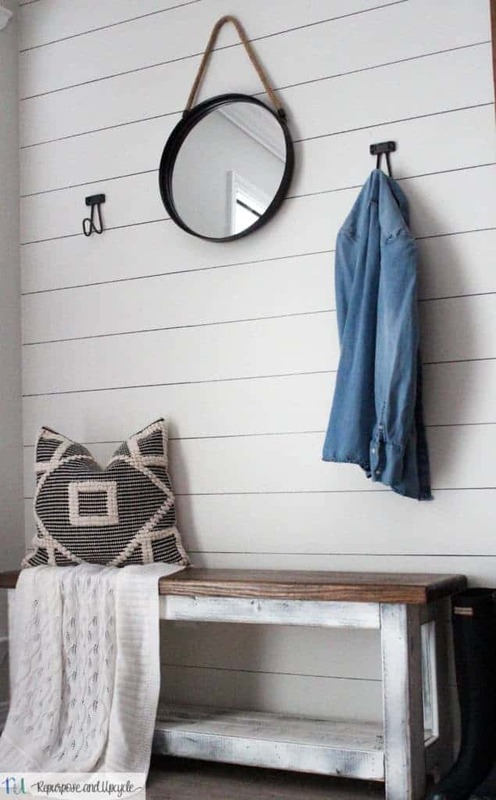 Enough talk, let’s get to the process of how I created this modern farmhouse entryway in under one hour with Sharpie shiplap. How do you create a faux planked wall? 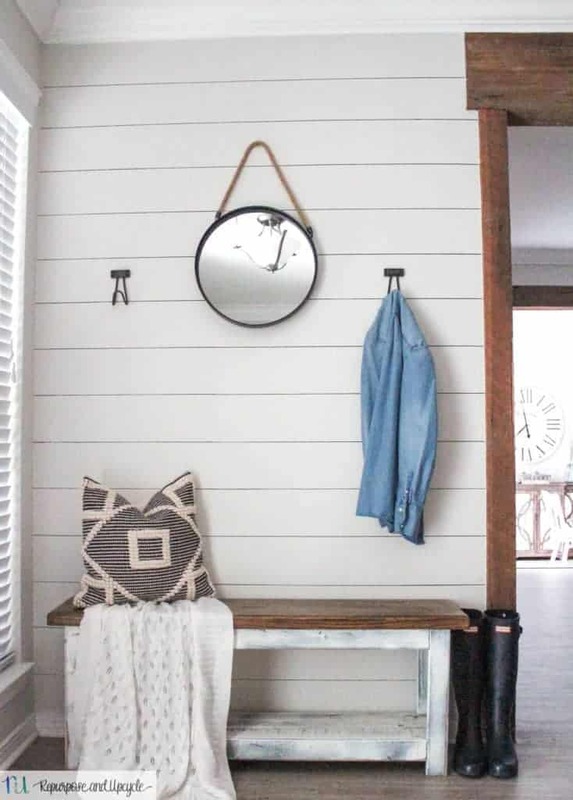 First let me show you my modern farmhouse entryway BEFORE this one hour makeover with Sharpie Shiplap. 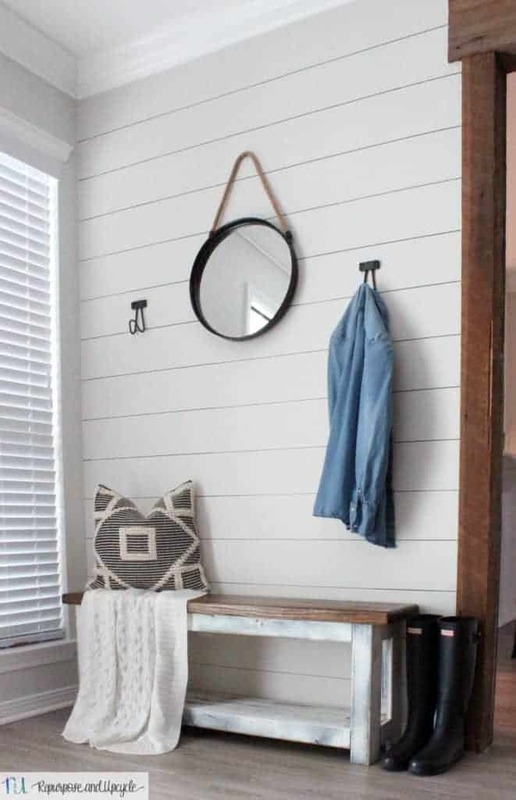 First, decide how wide you want your faux shiplap planks to be. I decided to make my lines 6″ apart. I’m not sure if there is a magic “shiplap width” but this is how wide our real shiplap is in our living room. Use a pencil to mark tick marks on the side of the wall every 6 inches. Line your ruler up to the first tick marl. After you’ve made sure the ruler is level, start drawing a line with the sharpie. Be careful to line up the point of the sharpie perfectly when you’re moving the ruler from one point to the next. I started at the bottom of the wall, but hindsight I should have started at the top. Lucky for me everything lined up, but if I do this again I will start at the top (like I say, learn from MY mistakes). 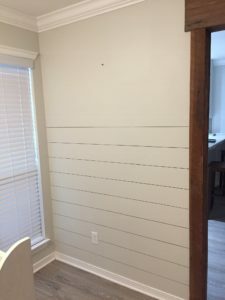 Continue making lines until you are done with the wall and you have perfectly drawn shiplap! I have to admit, after the first few lines were complete I thought I had made a huge mistake. 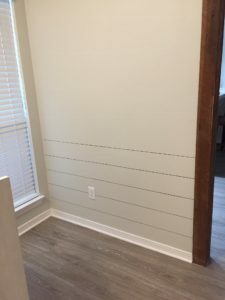 But after the Sharpie Shiplap wall was done, I was surprised at how much dimension it added. After adding accessories, it looked almost like the real thing. Let me share a quick video of the process. I’m finally pleased with our entryway. Best part, it really only took me about an hour to re create this whole space! I’m so pleased with how this looks, I’m already brewing about where else I can add a little faux shiplap! 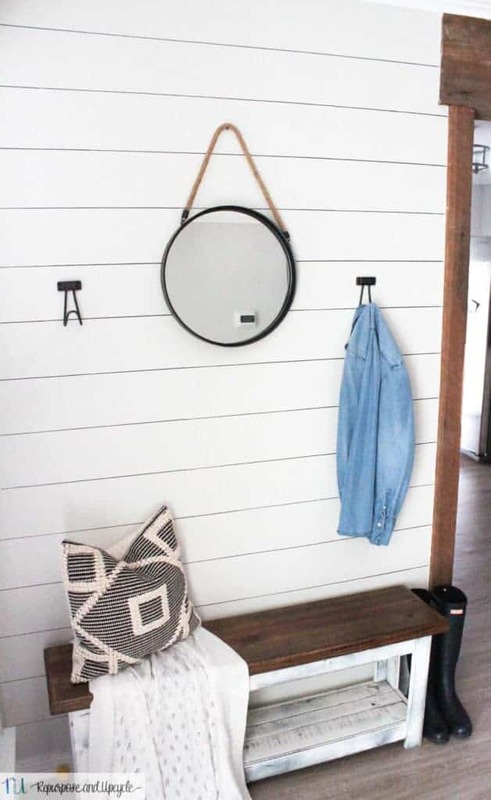 Would you take a marker to your walls for a little faux planked boards? 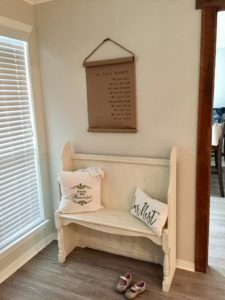 If you enjoyed this post you might be interested in seeing a few more spaces I created like it. Thanks for stopping by friends! I hope you’ve enjoyed this quick and easy space makeover in under one hour! Now to find another space to create! 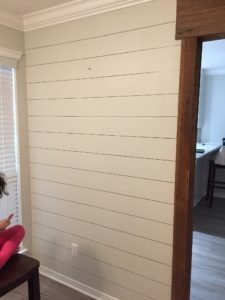 Your faux shiplap looks great! Thanks for sharing your space at the Merry Maids linky party. Thanks Jenny, it really does look real! It’s definitely a lot easier than doing the real stuff. Who knew sharpies were so versatile! Brilliant! This looks awesome. What a great idea! Looks so fantastic! It’s simple, but makes such a strong statement. Lindsey… this is amazing! Such a wonderful option… and so affordable. This would be a wonderful option for a rental, too! Would love if you would link-up at Homestyle Gathering! (I saw this at Home and Garden Thursday). Pinning! This looks great and doesn’t look like it was done with a Sharpie at all! Great DIY! That’s so cool! I couldn’t believe it was done with Sharpie! Amazing! How did you not have stop and start marks when you lifted the sharpie then put it on the wall again as you moved across the wall ? I think this looks great, but I swear I would have “dots” where I started again. This is actually very cute! I know what I’m going to do for my bedroom walls. Is the marker black? It almost looks gray.